We are working with the Daily Mail on a series about how adopting a 5:2, Mediterranean-style approach to eating can result in impressive results when it comes to weight loss. 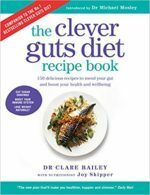 The pull out spread show casing the diet and recipes will be published in the Daily Mail in Mid Novemeber, just before the launch of my Clever Guts Diet Recipe Book which I have written to accompany Michael’s original book. Lots more recipes on the way! Hi Graham, that’s great thanks.